Below you will find some of the recent work our company has been doing. After working together with the home owner, we at Walter's Fine Wood Flooring of Santa Monica California carefully selected the right species of wood for the entire house. 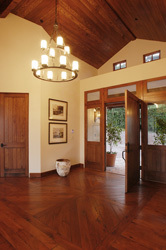 Since the homeowner wanted something different, formal, beautiful, and tasteful, we at Walter's designed a dramatic and spectacular entrance/foyer pattern connecting into the hallway and living room fitting the style of the entire house. Subsequent to the selection of the hardwood flooring,color was carefully selected. The process of selecting the right color for any type of house from Contemporary to Mediterranean is very important, and we are proud to say that we are the best in helping our customers select this right color! We at Walter's started the entire constructional process by firstly manufacturing the wood for the entire house. Secondly, we sculptured the hardwood by hand creating a product characterized by old style handcraft using old tone wood lightly wire brushed. This process and classic style is highly appreciated by our customers indeed! Prior to the wood flooring installation, the proper subfloor, plywood, is installed throughout the entire home. Then subsequent to the installation of the hardwood flooring, sanding, custom color, and finish is lastly applied. This careful process resulted in a much more beautiful color and grain than expected, leaving everyone so happy including Walter himself! The owners of their new home in the Pacific Palisades California called Walter from Walter’s Fine Wood Flooring in Santa Monica. These owners knew precisely what they wanted to do to with their new home in the mountains of the palisades. They wanted a parquet called Marie Antoinette with a modern light walnut color that resembled a very Old European Mediterranean–Style for their living room, library, kitchen, downstairs living quarters, and four upstairs bedrooms. A simple but yet elegant antique flooring technique used by Walter's Flooring for over twenty-five years was applied and then a color was selected and approved by the husband and wife and Walter's Flooring did the rest! After installing the hardwood floors, we let the floors set while the painters patched and primed the walls and ceilings. The final coat of paint was to be applied after the floors were finished. Subsequent to the painters patching and priming, Walter's Flooring returned and sanded, custom stained, and finished the floors. As agreed the painters returned and applied the final coat of paint. The end results was just what the owner wanted; a beautiful elegantly designed floor with a master finish!